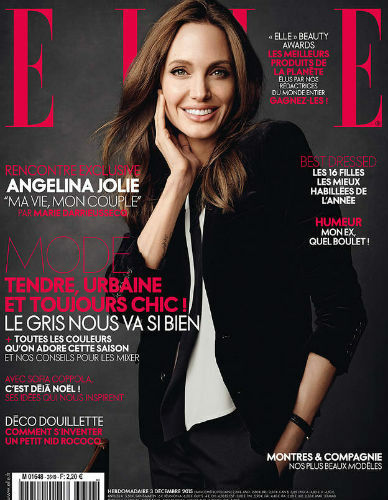 -This the most relaxed — and covered up — Angelina Jolie cover photo I’ve ever seen. Coincidence? -I didn’t catch The Wiz Live last night but by all accounts it was magical (my Twitter feed certainly loved it– though racist Twitter was also out in full force). The ratings were so great, NBC has already scheduled an encore for Dec. 19. Also, this backstage moment as soon as the show wrapped is adorable. –Justin Theroux almost died on his honeymoon. But did he wake in a strange hotel thinking he was an international assassin? -Now Lee Daniels is filing a motion to dismiss Sean Penn’s defamation suit. Sigh. -The One Direction boys are brave. On James Corden‘s show last night they played a game of “Tattoo Roulette” — and poor Harry Styles got stuck getting a tattoo on live TV. -Fans claim that Madonna uses a “fake police car” to cut through traffic in London which, if true, is kinda boss terrible. –Mike Colter is looking mighty fine in a hoodie in these first photos from the Luke Cage set. Damn, son! -Ruh roh. Orange Is the New Black’s Dascha Polanco (who plays the pregnant Daya) has been accused of assaulting a 17-year-old girl who was visiting her house. -The lovely Rachel McAdams headed back to Canada to raise money for charity this week. –Chris Brown says fatherhood has “mellowed him out.” God, I totally repressed the knowledge that he’s a father. I’m am decidedly un-mellowed by that. -I dig how many angry articles are being written about Arrow this week. Burn this storyline to the ground, Internet! –Seth Green, Macaulay Culkin and Bob Sagat hang out together? Ok.
–Tina Fey and Amy Poehler aren’t afraid of going up against Star Wars in this new Sisters featurette. -I really like Robert Downey Jr.’s take on Civil War in this interview. I really like his take on the power struggle between Tony and Cap. -Um, is Val Kilmer ok? -I love following Italia Ricci on Twitter. She just landed a major role on Supergirl — does this mean I need to watch that show again? –Ryan Gosling (your latest SNL host!) just shut down all those rumours of relationship trouble with Eva Mendes. -Meanwhile, here the trailer for Ryan’s latest movie, The Nice Guys. -I feel like the Batman v Superman trailer proves how much we’re just going to need to lean into the silly to survive this one.